The main reason for the Seven's limitations is seen here, where it is compared in size with a conventional Toshiba laptop. The Seven is a subnotebook, which means that it is small in every respect. The Seven hasn't got room for the usual array of Windows hardware (drives, controllers, ports), and this limits its usability. CD-ROMs are out of the question, for instance. The Seven is expensive - if you include a modem and a medium-sized CF card you're in the price range of a notebook - so think carefully before you buy. Until recently you could get a ROM/RAM/CF-based subnotebook with specifications very similar to the Seven. 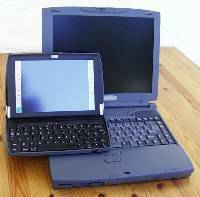 This was the now discontinued HP Jornada 820, based on the Windows CE 2.11 operating system. The fate of the 820, widely held to be an excellent device, shows how small the subnotebook market niche is. A common complaint from Psion users is the lack of on-board compatibility with popular MS Windows applications such as Office. You can convert Word, Sheet, Data and other Psion files to the Windows equivalents, but you need a PC with the included PsiWin software installed. Even then you will sometimes run into problems when converting between formats. Psion has been blamed for not responding to users' demands in this area, but to be fair it isn't easy to keep up with the ever-changing Windows "standards". For instance: although many users want a "Save as MS Word" feature in Psion Word, there is no agreed-upon MS Word format. Word 2 differs from Word 6, 97 or 2000. Better then to go for another common Windows text format, RTF. Which is what several software companies have done. nConvert and Xconverter (see the software page) makes your Psion independent of a PC when you want to convert Word, Sheet and image files to PC standards such as RTF, HTML, XLS and JPG. However, this will not change the fact that most Windows applications will never have an EPOC version. What you need to look at if you want to use the Seven as a stand-alone computer is this: if the applications you depend on don't exist on the Psion, are there similar applications for EPOC? Do they save files in a format that is easy to exchange with users on other platforms? With 16 Mb RAM, a 133 Mhz processor and VGA-size, 8 bit colour STN screen it's fairly obvious that the Seven won't handle image files as well as a state of the art PC or Mac. If advanced gaming, illustration or heavy photo editing is your main interest, stay away from the Seven. There is one exception to this rule, though: the excellent 3D game EDoom demonstrates that first-person gaming is not only possible, but even quite enjoyable on the Seven. As part of Psion's "Enterprise" strategy, only the more advanced (and expensive) netBook has support for LAN cards. It is possible to play MP3 files on a Seven (there is also a player for the netBook, which is able to run the SavaJe OS). But though CF disks with plenty of space to store hours of music are cheap nowadays, the Seven lacks the sound hardware needed to do MP3 justice. All you get is a mike and a tinny speaker, and no headphone jack. The same goes for video. And let's face it: the Psions were never meant to be entertainment devices. If this is what you're after, you will be much happier with a Pocket PC unit from HP, Compaq and suchlike. The Seven uses the Compact Flash (CF) medium for data storage. Most CF disks are fairly small, but as most Psion files are also amazingly small this is of little importance. But if you want to use a Seven for editing images from your digital camera - which is possible if you have a camera that stores pictures on CF disks and you have purchased MBMView (see the software page), the 16 Mb disk suddenly becomes very small. CF disks now come in sizes of 200 Mb or more, but they are very expensive. A better choice would be the IBM Microdrive, which is a CF-sized hard drive up to 1 Gigabyte in capacity. The 5 and 5mx came in versions specific for different languages. The Norwegian verson, for instance, had the special characters æ, ø and å stamped on the keyboard. The Seven comes in UK/US varieties, which means that you need to get software such as Keyboard Remapper (see the software page) to customize your keyboard for your language.